Severna Park, MD is privileged to be surrounded by two rivers full of marine life. The Severn River and the Magothy River that border the community are known especially for the Maryland Blue Crabs that crawl through the depths of their water. The natural capital of the crabs and other seafood sustenance of the water flows into the culture of the town. According to the Cultural Iceberg model, culture can embody itself in a community on the surface or in deep unconscious states. Surface culture is easy to discern and seen and manifests itself in events, music, goods, and other visible ways. The Maryland Blue Crab and the river water life is the basis of much of the surface culture of the community. The community prides itself on its interconnectedness to the waters and the crab. One example is the annual crab festival at Hatton Memorial Beach in the Olde Severna Park community (Voice Media, 2016). This is cultural capital in an embodied state of a celebration with food and music which are both forms of surface culture. It is evident that the crab is a basis of the community’s identity and the act of getting together and sharing the sustenance of the crab brings the community together. It is also exemplary of deep culture from the Iceberg model that rests beneath the surface of the community in intangible ways such as mental models, attitudes, and beliefs. The unconscious rules of the community’s relationship to animals is that the water is a source of food, but also a sense of pride the community has in the ecosystem that flourishes in their natural capital. The cultural capital is a huge factor in building social capital for the community, because as you can see from it creating celebrations, it allows for bonding and bridging capital of neighbors who know each other well to get even closer and those who don’t to form strong or weak ties. There is currently a threat to the culture of the community. This lies in the fact that the population of crabs was depleting for many years due to the poor water quality leading to algae blooms that depleted the oxygen from the waters and caused much of the marine life to die (Chesapeake Bay Program, n.d.). But, programs like the Chesapeake Bay Program work to put in place regulations on harvesting crabs, like not being able to catch females, and on improving water quality and it has paid off. In fact, from 2015 to 2016 measures indicated that the female crab population, responsible for reproduction and future generations of crabs, spiked from 101 million crabs to 194 (Chesapeake Bay Program, n.d.). This presents hope for the culture of Severna Park to stay in tact. Also, the crab theme trickles into the arts-based businesses and creative economy of Severna Park. A community-based organization called Artworks Studio holds art classes for kids and promotes it as a way for kids to be introduced in engaging in their creative side. They complete different projects to bring home to their families. 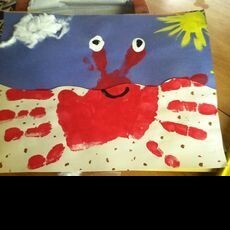 They even have a parent and child combined class where the parents and children make a handprint crab design (Hulafrog, n.d.). The community culture with a theme of crabs is embodied in this art good created.